Calvados is a pear and apple-based brandy from the northern part of France along the English Channel in the Normandy region. With a history dating back nearly 500 years, the region has a long tradition of distilling their ciders into delicious and complex spirits. While not as well known as cognac or armagnac, calvados holds a dear place in the hearts of many spirits lovers. 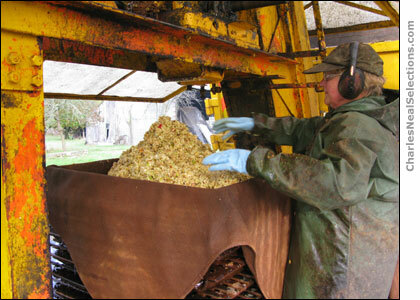 To create calvados, apples and pears are collected from the ground during the autumn and pressed into juice. The unclarified juice is then fermented into a cider with between 6% and 8% alcohol. This cider is then passed through a still, where a 70% alcohol will eventually emerge. This clear spirit then goes into barrel, where it picks up color and additional aromas and flavors. It can be sold after its third birthday but is often aged for much longer. Calvados has traditionally been drunk after a meal, partially because of its digestive qualities. And while it is highly enjoyable to have a snifter after a meal (perhaps in another room and in a comfortable chair), calvados can be enjoyed under many different circumstances. Popular nowadays are cocktails made with calvados, while the spirit is also used in many culinary preparations. What's more, a glass of calvados is fantastic in everyday situations, like while watching a DVD, Monday Night Football, or working on the computer at night. The Pays d' Auge was established in 1942. 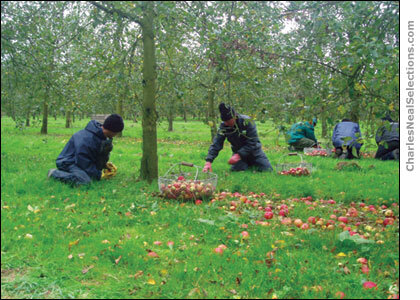 Apples dominate in the Pays d' Auge, and most calvados in the region is made with only apples. Calvados from the Pays d' Auge must be distilled twice, a process that sets it apart from the other appellations. At one point, the expansive area now known as Appellation Calvados Controlee was divided into regulated regions, spread all across Normandy and spilling across the borders of several neighboring departments. These regulated regions were grouped together in the 1980s. The soils vary widely from region to region. Most producers use only apples in their cider and the majority distill their cider once in a column still. This appellation, established in 1997, surrounds the town of Domfront in the Orne, from which it takes its name. 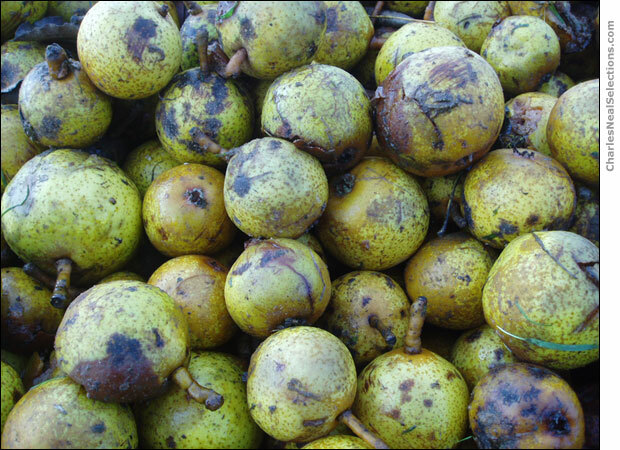 Using at least 30% pears in their distillate is obligatory in the Domfrontais, although it is common for some producers to use 70% or 80% in their ciders. Distillation takes place once in a column still as is done in Appellation Calvados Controlee. ​Unlike armagnac and cognac, which are made from grapes, calvados is derived from apples, pears, or a combination of both. ​For the most part, these apples resemble crabapples. They are not the types of apples one would pick off a tree and eat, as they can be quite tannic, dry, or mouthwateringly sharp. Most of the apple's flavor comes from the skin rather than the pulp, and the small size of the apples insures maximum flavor. A large variety of apples is also important for other reasons, including pollination, alternative bearing, and the differing harvesting periods. Pears are also used for calvados, specifically in the Domfrontais region. 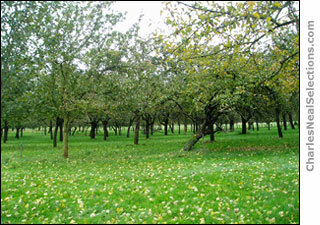 There are over 200 varieties of pears used for pear cider or poiré and about 30 are commonly found throughout the Norman orchards nowadays. Pear trees have a deeper root system than apples They thrive on the deep clay and granite soils of the Domfrontais. Although pears can be found in other regions of Normandy, many of these are on dwarf rootstock and used more for the emerging poiré category rather than for distillation. 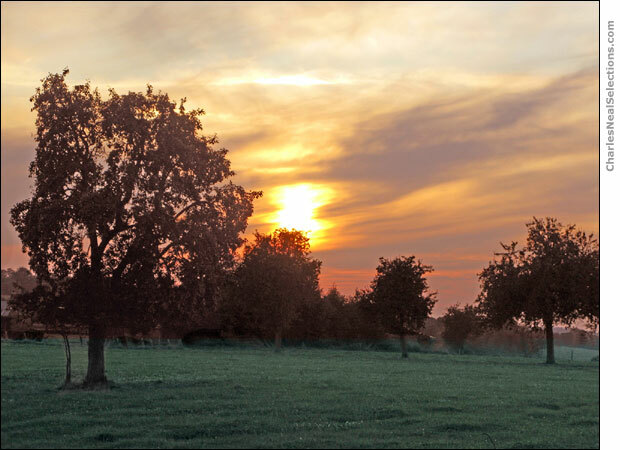 in Southeastern Normandy near CoquerelleTwo types of rootstock exist in Normandy that affect the size of the trees and the density in which you can plant your orchard. Standard RootstockTrees grown on standard rootstock reach about 30 feet in height and are generally planted 10 meters apart from each other. They normally don't give much useable fruit until about their 20th birthday. Dwarf RootstockApples and pears can also be grown on dwarf rootstock. These can be planted at much higher density and begin giving useable fruit by a tree's third or fourth birthday. Trees on dwarf rootstock often see chemical treatments, while those on standard rootstock do not usually need treatments with synthetic chemicals. Many of the trees used in dwarf orchards produce apples that will eventually make their way into bottled cider, while many on standard rootstock are ancient varieties with a solid track record for producing ​quality spirits. Time to gather colorful apples for calvados at Domaine Dupont in the Suisse-Normandy. As it takes two hours to traverse the Calvados appellations in a car from north to south and four hours to drive from east to west, it should be evident that the soils vary greatly across the region. Soil perhaps plays less of a role with distilled spirits than it does for table wines. This is because spirits begin with a base matter that is converted into alcohol and distilled before aging in oak for an extensive period. All of these factors have an important effect on the finished product. But soil does play a role on a tree's growth as well as with an apple's acidity level and pH. The Pays d'Auge has high quantities of flint (silex) in addition to clay, and this stony soil makes the tree suffer, with many of the nutrients going to the developing fruit rather than the tree's wood. On the contrary, the Suisse Normande (located in the AOC Calvados region) has a lot of silty clay with some stone mixed in, and apples tend to have more acidity and a bit less sugar, which often leads to a more elegant spirit with purer apple flavor. Flint (silex): A sand-based soil type that is formed from a mixture of clay, limestone, and silica into hard, shiny green pieces. Clay (argile): Along with sand and loam, clay is one of three principal types of soil. Clay binds other kinds of particles together and retains water well. The soil is often very cool and high in acidity. Too much clay, however, makes cultivation difficult because it prevents free circulation of air around the roots. The best clays occur in sediments and sedimentary rocks. These were generally inherited from adjacent continents and carried to the ocean by rivers and wind. Sedimentary rock-based soil has good water retention capability but poor drainage. Silt (limon:) A more fertile soil than sand, and constists of finely-grained deposits that offer godo water retention but mediocre drainage. The Domfrontais region has more schist and granite-based soil in which pear trees thrive. Schist (schistes): A metamorphic rock that changes when under pressure. Most schist has been derived from clay and mud that has passed through a series of changes involving the production of shale and slate along the way. Schist retains heat well but is poor in organic nutrients and nitrogen. It often contains minerals like mica, chlorite, talc, graphite, and quartz. Granite (granites): A course-grained, light-colored, hard rock consisting chiefly of quartz, orthoclase, microcline, and mica. One of the most comme rocks of the Earth's crust, it is formed by the cooling of magma. It is often used in monuments for building. Granite allows much more water retention than dryer soils like schist, and water retention helps produce more fruit, albeit with a bit less sugar. This soil warms quickly and retains heat well. As with Cognac, pot stills are used in the Pays d'Auge. The stills vary in size so that anywhere between 400 and 2,500 liters of cider can be distilled at a time. With distillation in a pot still, more of the impurities of the exiting spirit — especially the heads and tails — can be removed, leading to what most will agree is a purer spirit, although with less initial aroma. The great majority of calvados producers convert their cider into spirit in a column still. These are sometimes solidified with brick and mortar, but usually pass from farm to farm attached to a chassis and pulled by a tractor. Cider enters the column still and is heated, then rises through a series of copper plates, gently increasing in alcohol as each plate is passed. The vapors are then cooled so that they convert back to liquid form. This is the same process we see in armagnac distillation. Armagnac stills, however, tend to have 7 or 8 plates and the spirit often exits at 52% alcohol. 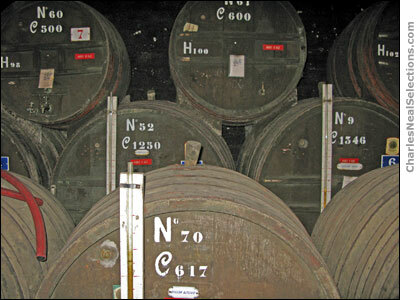 A calvados still often has 15 plates, and the exiting spirit flows out at 70% alcohol. Column still used by Alain Boisgointier to distill calvados in the Domfrontais. 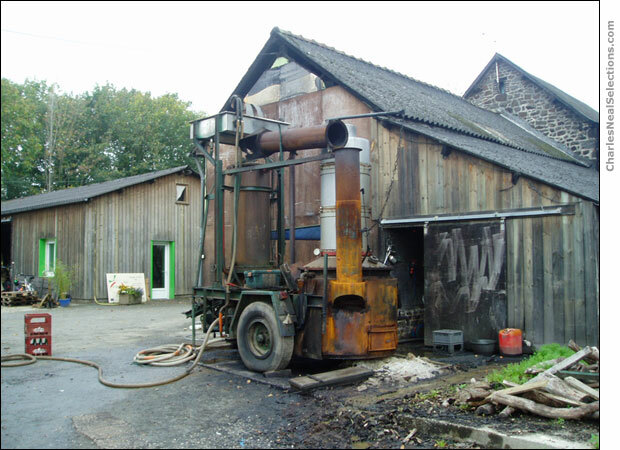 Most calvados goes into well-seasoned oak casks rather than new oak barrels. While small amounts of heads and tails can be manually removed, more esters and acids remain in a spirit distilled once. On the other hand, aromas can be more forthcoming with a calvados distilled in a column still. A column still also has the advantage of being much faster and less expensive. Once the spirit exits the still, it goes into oak casks where it will pick up color, tannin, and notes of vanilla, caramel, toffee, and spice. During this aging period, it will also be reduced in alcohol with the addition of water so that it nears its final release strength of 80 to 84 proof. While in cask, the alcohol begins to mellow while the flavors move from floral and fresh to more concentrated and condensed. Additional aromas of honey, toffee, and nuts might also arise adding to the complexity of a well-aged spirit. There are approximately 200 producers in Normandy who bottle and sell their calvados. Some sell a few dozen bottles a year, while others sell thousands of cases. 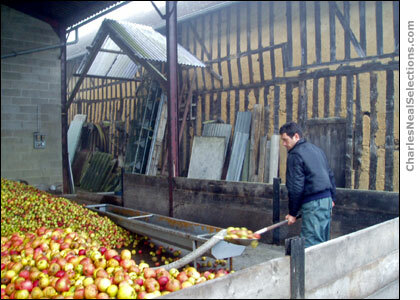 Small agricultural producers are often farmers, who make part of their income through cider and calvados and the other half through dairy farming. They grow their own apples on land that they own, press their juice, ferment their cider, distill their product, and age it on their property. 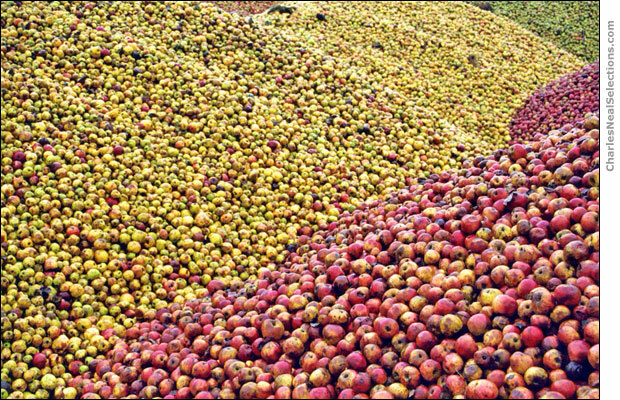 Large-scale producers may or may not own apple orchards and can also supplement their own production with calvados that they did not make themselves. Rather than producing their spirits on a bucolic property, large producers often produce in immense warehouses bordered by large parking lots. The large producers are normally more interested in blending, using various techniques to create a consistent taste a domestic and international clientele demands. Agricultural producer crushes pears for making poiré.